This stunning 3 bedroom / 3.5 bath oceanfront penthouse offers a Master Bedroom on the first floor and a Master bedroom on the second floor, with One king Size Guest Bedroom with balcony all ensuite. All of this with over 4,500 square feet of living space, nothing short of amazing; Penthouse 9 is located right in the heart of Puerto Vallarta’s Romantic zone; along side of the River Cuale, facing the famed “Bay of Banderas” (Bay of the Flags). With balconies from every bedroom and living area, this luxurious unit of Molino de Agua is new construction with new professional furnishings and décor. Enjoy Barefoot Luxury in downtown Puerto Vallarta. Just steps to shopping, beaches, dining and nightlife! With magnificent views of the Bay of Banderas, River Cuale, Sierra Madre Mountains and city lights -- you may never want to leave! Combining luxury with nature, PH9 at “Residencias Molino de Agua” offers an elevator right to your door; private pool on the spacious second floor terrace adjacent to another master bedroom suite with King bed and a large bathroom featuring large whirlpool garden tub, large walk-in closet. On the main floor, there is a 2nd master bedroom with King size bed, bathroom with whirlpool tub, and large walk-in closet. Bedroom #3 features a King Size size bed, and bathroom with shower. The main floor living area also has 4th bathroom/powder room. This beautiful home sleeps 6 guests, adults preferred. Flat screens, cable tv’s, dvd, ipod docking units, gas grill on terrace, charming décor. Central A/C. This property offers a gated ingress and egress entry, a huge beachfront common area swimming pool, a riverside garden area, and an elevated sandy beach with sunning area combine with easy walking access to all of Puerto Vallarta’s attractions including art-walks, restaurants, cathedral Iglesia de Guadalupe, Los Arcos Amphitheatre, the Malecon, and much more.? I have been in the vacation and resort real estate industry for many years and I own a real estate company here in Puerto Vallarta. I feel in love with the local people and the incredible lifestyle Vallarta has to offer. If you enjoy the Banderas Bay area as I have and would like to investigate the possibilities of ownership don't hesitate to let me know. I'm happy to help in any way I can. Puerto Vallarta is an easy place to get to from almost any major city in the US and Canada. Its clean here and the local people are hard working and happy to serve which make living here and incredible opportunity. Puerto Vallarta is a safe city to live in and offers a friendly atmosphere that is hard to beat. Its easy for friends and family to visit and there is always something to do when you are here. You simply cannot beat the location for convenience, living space, and being near all the exciting things that happen in Puerto Vallarta. It's the best condominium development in the bay for that reason. We had a wonderful time at Emiliano Zapata. The suite is amazing and views are incredible. The amenities and location are unbeatable. Such a wonderful city, we can't wait to come again. Thank You So Much Adam , we hope to see you back soon. Highly recommend this beautiful property. It is well furnished and has great views of the ocean. Molina de Agua is one of the best buildings in PV. Highly recommend. We stay here for a week to celebrate our birthday with our family. It is just amazing. It could not have been more perfect for our family of 6 with two married children. The service was also fantastic. I liked it so much I sent a video to my sister to tell her to look at coming here. We are glad your stay at Casa Playa was an amazing one. We look forward to having you as a guest in the future. Us 3 couples spent a week at this gorgeous penthouse, which was pure heaven. Revisiting Zona Romantica is always fun and relaxing, but experiencing it while staying at this most private and classy home, made our visit even more fabulous. The PH is spacious enough to feel alone when on separate floors, and never crowded regardless of party size. The amenities were outstanding, especially for daily cooking, barbecuing and everything in between. Washer/Dryer is a must, as it allows for light packing and fresh clothes, towels each day. The refrigerator/freezer is large enough to hold food and drinks for a week. Each bedroom is it’s own masterpiece, beautifully decorated with comfortable beds and oversized closets and bathrooms. The downstairs bedrooms share the morning sun and have their own balconies to overlook the city. Unfortunately, you may be woken up from the never ending club sounds near by in the early mornings... As you enter the PH, you’ll be amazed at the open-concept kitchen/frontroom with million dollar views of ocean and the quaint old town. The charming but spacious terrace is covered and comfortable for all day use, including nightly firework shows from the Pirate Ship. The upstairs bedroom is perfection with wall-to-wall doors leading out to a pool and partial covered deck area. Our doors were never shut, allowing the soothing sounds of the ocean and warm breeze for total relaxation and great sleep. Besides the occasional bird stopping by to say hi, there were no bugs to deal with. This PH was so perfect, we only used the well maintained,, undercrowded common pool area for walk through to the private beach, and Malecon or Restaurant/shopping entrance. Mayra, the housekeeper, is wonderful and very helpful with anything you need. A convenient store and taxis are outside the front gate, and staff are friendly and helpful. You’re in the heart of everything, all in walking distance. This is one of the most beautiful places we have visited, and look forward to our next booking. A MUST experience! We look forward to having you at Casa Playa again. Saludos from Puerto Vallarta. It was breath taking, better than the picture look. This was the most amazing place we have ever stayed at with VRBO. The pictures really don’t do it justice. The only question each day was which terrace should we hang out on next. Our contact Hector was very helpful and responsive to all questions and Myra who did daily cleaning was wonderful. Thank you !! !We hope to have you back soon. I just returned from a week stay at this unbelievable home. Everything was perfect. 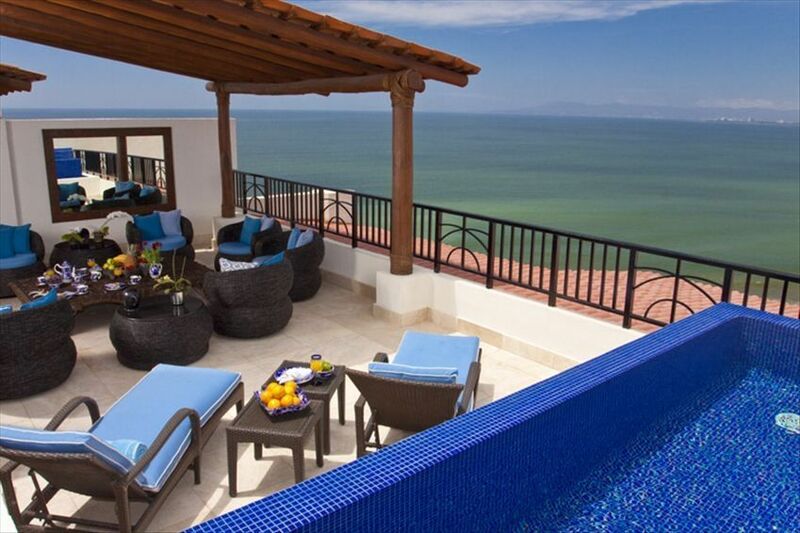 The home, the view, the location in PV as well as in the complex couldn't be better. The furnishings are beautiful but comfortable and inviting. So many hours on the decks simply enjoying the sound of the ocean and the view. The nighttime city light view is amazing. We enjoyed our own private pool as well as the amazing pool for the complex which is perfect for easy access if you have any mobility issues. There is nothing I can suggest for improvement to penthouse 9 nor the exemplary service we received from Hector the property manager and Maya the amazing housekeeper. My only regret was I hadn't been able to book a longer stay. During the winter months there is an extra charge for heating the private pool of $150 USD a week. It is optional to heat the pool.